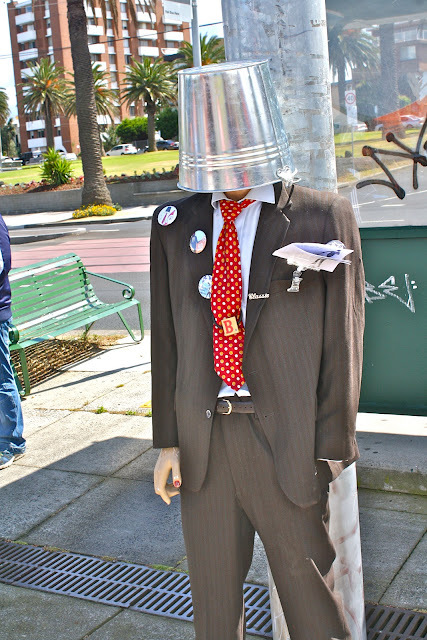 If you are not a fan of the city in Melbourne, you should check out St Kilda. 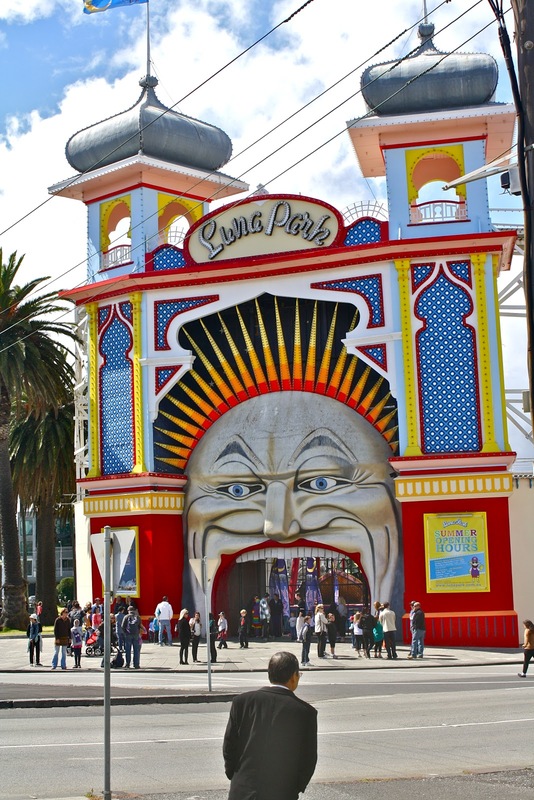 It is home to Melbourne's most famous beach as well. We decided to pop by there on a Sunday and there was a flea market going on that sells handicraft and paintings. The weather was clear, but the winds were really strong and the smart me decided to wear flip flops and berms out so half the time i was clinching my teeth together. Like i mentioned earlier, the pavements (just along the road) has stalls selling random stuff. The most common thing you would be able to find will be paintings. They weren't fantastic, and looked normal in my honest opinion - nothing artistic of that sort. Apart from that, St Kilda also has an amusement park (Luna Park). There really wasn't much to do at St Kilda except the fact that the place was nice to explore, and that the weather was good. However, if i am not wrong, the flea market only operates on specific days so my advice would be to check before heading down, just so there will be at least something to do. I randomly managed to snap the picture above of a little girl running down a slope. I love how the Western culture works in Australia, where parents would let their kids do what they want to do. By the way, the girl was literally rolling down the slope before she got up and started running down, and there was her mom snapping pictures of her - things you don't experience in Singapore. We decided to drive from Melbourne to Bendigo, which is about two hours drive from Melbourne. Along the way you see kangaroos on the road, horses, as well as huge houses and vineyards. The city centre was pretty quiet for a Saturday afternoon, and the shops were not at all interesting in my opinion. Life there is pretty slow paced as compared to Melbourne. We ended up at Lake Weerona and having lunch at The Broadwalk Bendigo. The food there was really good. The Beef Ragout had chunks of tender beef, carrots, celery and mash at the bottom, finished off with shaved parmesan. And yes, with the weather at 14 degrees, nothing like a hot meal like that could have been better. I also had the best slice of Lemon Tart in my life. I was comtemplating which dessert to order and the waiter recommended it. It was mind blowing out of the world. The crust was perfect, and the tart was not overly sour. I would go back for it if it wasn't a two hours drive from Melbourne just to get there. Took a walk around the lake after lunch and spotted ducks and parrots roaming around. This is a sight you would never be able to get in Singapore. Ducks and ducklings waddling around you, and parrots on the trees - felt like paradise. 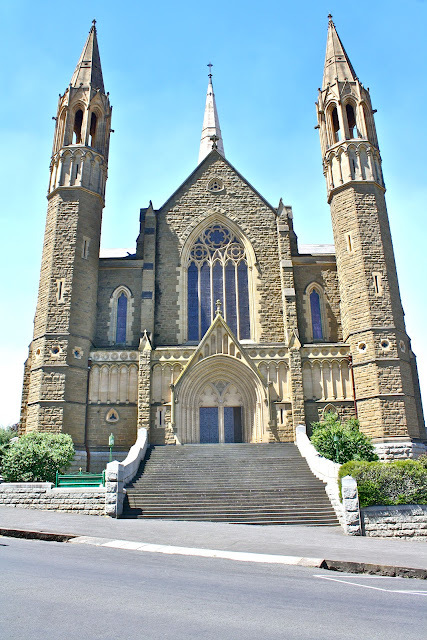 We also stopped by Sacred Heart Cathedral, which looks like a castle you would find in Scotland. Bendigo isn't as interesting as Melbourne, but a two hours drive for a getaway that feels totally different isn't exactly a bad idea. I've been wanting to go back to Melbourne for awhile now. It has been at least five years since my last visit to Melbourne and finally there was a reason to come back to visit this amazing place. My uncle recently moved for good and i decided to come visit him since it was the end of the year plus i needed a break (yes, a real break this time round) after the incident at Bintan. I love the weather because it is spring and the flowers were all in full bloom. The sun rises in the morning at 5.30 and sets only at around 8 in the evening. Even with the sun, the temperature stays around 10 degrees, with cool breeze throughout the day. Also, point to note that if you need a prepaid SIM card for your mobile, Yes Optus has pretty good deals. I paid AUD 32 for 250 minutes worth of call time (can make calls to Singapore as well using the 250 minutes), 500MB of data (they later added another 200MB making it 700MB), as well as free calls and text messages to Yes Optus numbers. Generally i just needed the call time and data, which i thought wasn't every expensive since they are quite generous. We decided to check out the city so and ended up at Flinders Street Station, which is one of the most used train stations in the city. From here, you can walk around the city by foot and access Queen Street, Market Street, Bourke Street and Collins Street, which has a lot of shopping featuring mid-tier brands to high end fashion houses. 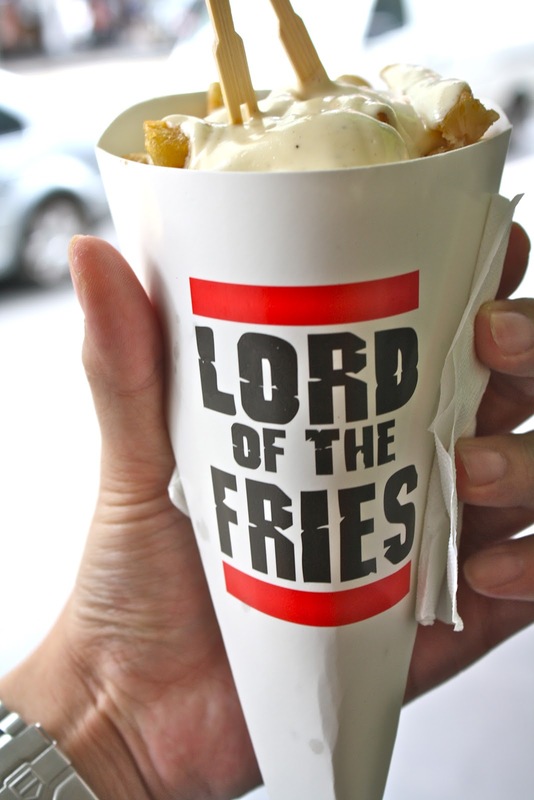 You can check out this place called "Lord of the Fries", located directly opposite the street of the main entrance of Flinders Street Station. They serve pretty good fries in my opinion, either that or the weather just made those warm fries taste better than usual. 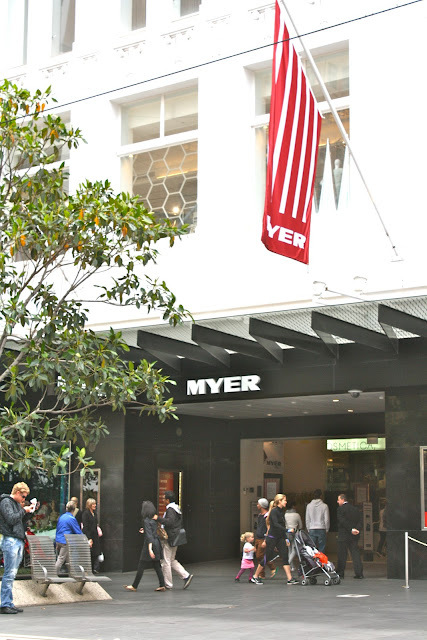 On Bourke Street, you will find Myer, which carries brands like Calvin Klein, Mulberry, Givenchy and Alexander McQueen. Directly beside it, you will find David Jones, which also carries high end fashion brands such as Miu Miu, Fendi, Marc Jacobs and Burberry. Of course, you can find other shops on the same street as well. We settled for an Italian Cafe at Block Place for lunch. Cafe Segovia serves up pretty decent Italian food. The place was pretty packed so we decided to give it a shot. The food (Spaghetti with Mussels, Grilled Snapper) was good, but not fantastic. Because the shops close around 6 in the evening, it is easier to have dinner at home. May i also please add that my aunt (who joined me on this trip) is an amazing cook. 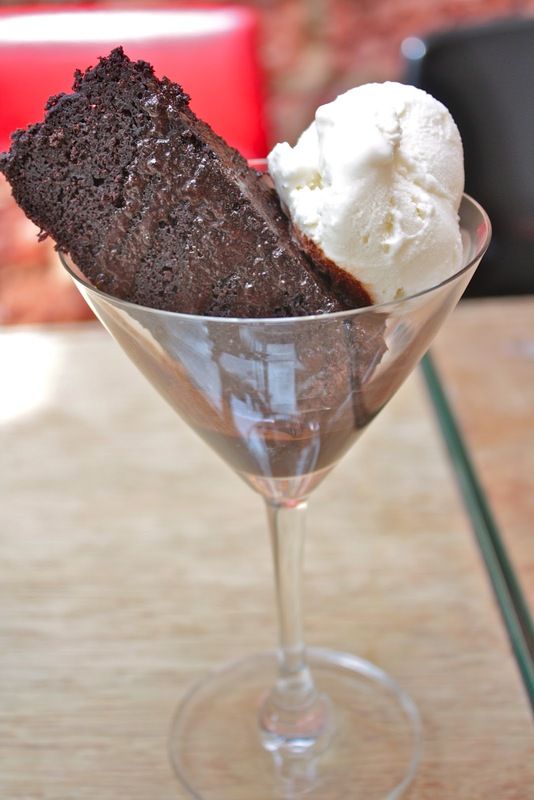 She whips up the most amazing dishes effortlessly. We went to Preston Market to shop for groceries. They have the widest range of seafood, meat and vegetables. The tomatoes looked so fresh and ripe i wanted to just bite into one almost immediately. You can find a row of shops selling food at Preston Market. There is one that serves very good pizza, and another that sells very good cream puff and cannoli (both in the same row). 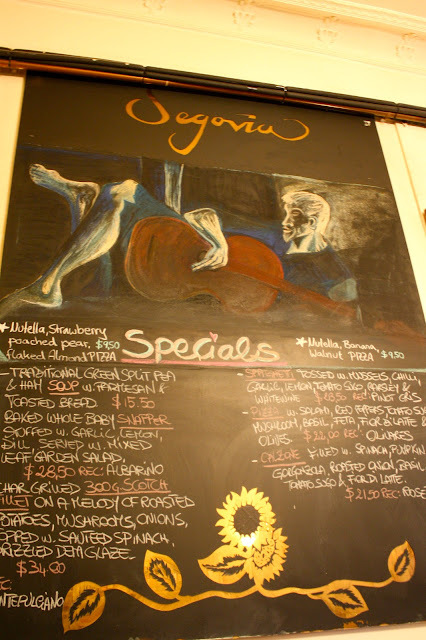 Seats are scarce but because it doesn't really require you to sit down to have a pizza or pop a cream puff, nothing should be potentially stopping you from sinking your teeth into these delectables. 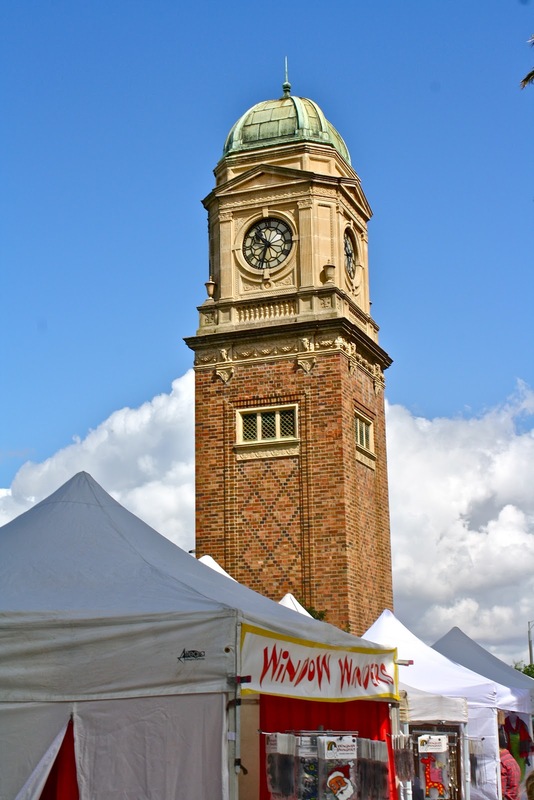 The food stuff are generally cheaper at Preston Market than compared to the supermarkets. Also, the whole place smells very fresh, and does not have a stench. I could possibly bring myself to go grocery shopping everyday if i were to be living there. And yes, that will mean i also need to find someone that can cook.